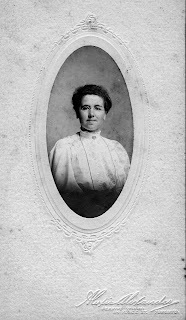 The photo is a picture of my grandmother, Janet Gertrude Johnston. I would put this photo in the stockings of my siblings. The photo was taken in Toronto at the Perkins Studio on Yonge St. by Alexis Alexander, year unknown. I am sure that it is my grandmother but I find confusing that on the back of the cardboard frame, it says Aunt Gertie. I know my grandmother went by Gertie and not Janet. Honestly, why wouldn't she go by Janet? I think it is a very fine name. Her siblings also went by their middle names. I don't know who would have written Aunt Gertie on the back. This photo came in the batch of photographs that once belonged to my great Aunt Margaret. They would have been sister in laws. I know of no other Gertie in that family line. My first cousin, Valerie, I think looks very much like her grandmother. 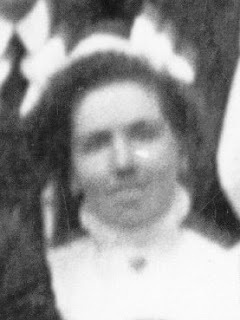 Here is a photo of my grandmother from her wedding picture. Unfortunately, it is not that clear but it certainly looks like the same person. I think Gertie is a fine name - but can you imagine anyone using that name now? It seems to me to definitely be an old fashioned name. I enjoyed your posts about her.